Proud of its locally supplied products and strong community support, family-owned Country Grocer is an independent grocery chain based in British Columbia. When it came time to add a new store, the grocer turned to Nanaimo’s own BuiltGreen builder, B Gallant Homes [i] and its principal, Bryon Gallant. Gallant, in turn, brought Insulspan to the project. The result was a new and energy efficient commercial building. 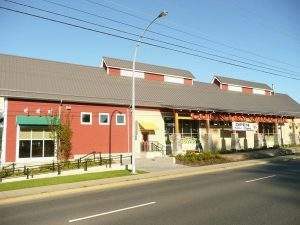 With a planned location in the Green Rock development in Nanaimo, it was imperative that the new Country Grocer store be more than simply energy efficient. It needed to embrace green standards across the building process. The reasons for this were two-fold. Firstly, the Green Rock development was designed to incorporate bio-swales [ii], rain gardens, and other green solutions in its community design. Secondly, Country Grocer is part of the Capital Regional District (CRD) Climate Smart program, an initiative that helps local businesses reduce their carbon footprints while cutting costs. This Country Grocer store has approximately 40,000-square-feet of retail space. 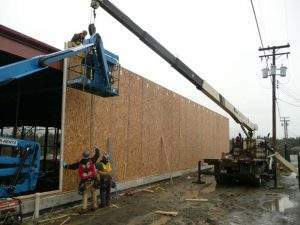 Incorporating Insulspan SIPs into its construction, meant the tedious labor of framing, sheathing, and insulating walls became a quick, one-step installation process. The one-step process also decreased costs. [i] B Gallant Homes: no longer associated with this project; Island Westcoast Developments (IWCD Ltd) built Country Grocer’s award-winning Chase River store; it is the group holding interest in this location. [ii] vegetation/compost/riprap filled landscape elements used to replace concrete gutters; typically used for parking lots and roads.